Two minor girls died of dengue near Immanuel's home in Gavi Mohalla in year 2017 and that triggered his fogging work. There are 1.3 billion people in the country and with trillions of problems. While few complaint, some more crib but there are very few who take an initiative in solving the problem. It needs guts, deterioration and a sense of belongingness to the society. Immanuel Pathare, is a leader without a team to lead. A last bencher who always pulled himself back from answering in the class or share his idea thinking there are people far better than him, joined LEAD through an orientation program in his college. While all others took a step back he decided to use the opportunity. 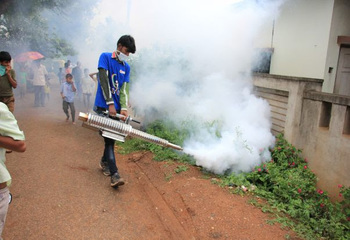 Right then, Hubballi witnessed 900 plus cases of dengue. That's when Immanuel came up in the avatar of 'FOGMAN'. A boy who weighed 55 kgs lifted 40 kgs fog machine and fogged the city. Everyday thereafter, he wakes up at 4am and goes about fogging every nook and corner of his locality. 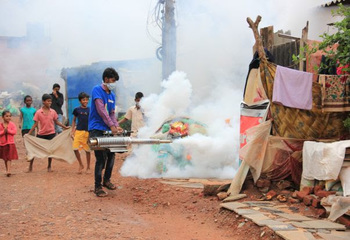 Immanuel began fogging some slums of the city, in October last year and has covered a population of 1.25 lakh till April. After writing his exams in June he will resume fogging ‘operations’. 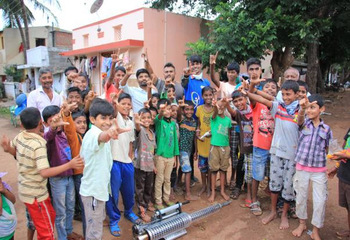 He hopes to cover the entire six lakh population of the twin cities of Hubballi-Dharwad. Good work always pays. Today his initiative has not just helped Hubballi, but this idea is adopted by Belgaum, Bijapur and other districts as well. He is an example of transformation. You do not need a team, all that you need is an urge to serve the society. If you have that then there is nothing that can stop you. People around here fondly call him the ‘Fogman of Hubballi’. 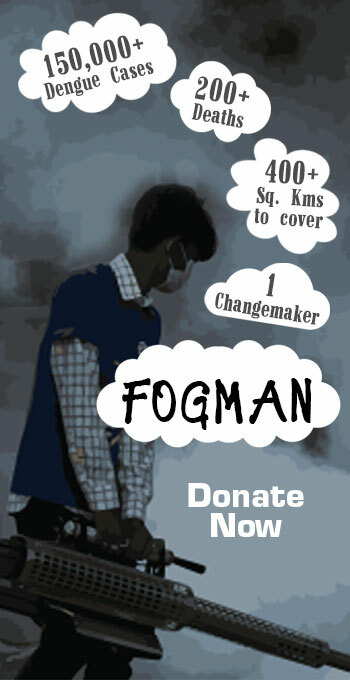 Currently, we are doing a crowd funding campaign for our FOGMAN. If you can help us get a word out about it, we would really appreciate your effort.